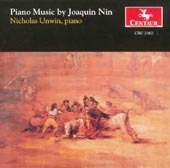 JOAQUIN NIN | Nicholas Unwin | - Norfolk Based Jazz & Classical Pianist. "Unwin plays as if to the manner born: his way with these arch-Hispanic textures is not only thoroughly idiomatic -- it's little short of masterly. These are thrilling performances"
"Unwin’s clean, concise, idiomatically alert accounts prove rather attractive advocates of a lively repertoire." "…a superb pianist. I have rarely heard a more authentic performance of my father’s music."